So after our extremely successful 5K on Sunday, I had a bit of a scare. My hip was doing fine and my SI joint was a little sore as expected after running as hard as I did. In the afternoon during the football game I went outside to give to dog some exercise. I really didn’t run, but trotted along to get him going. After a couple of steps my left leg collapsed beneath me. Literally I fell to the ground as if my leg wasn’t there. Hmm… that can’t be a good sign. Since then my leg has improved greatly. I used the heating pad all day Monday and took anti-inflamitories. I also rested and haven’t run or walked (for exersise) since Sunday’s race. Yesterday I almost couldn’t drive to work because I use a stick shift and pushing in the clutch was painful. Also at work as I got up from sitting, I would be in a lot of pain for about 15 seconds and then it went away slowly. Today I feel about 80% better. No problem using the clutch and getting up doesn’t hurt. So, I think for the most part running that race didn’t set me back too much which is good. I am still doing my stretches and using anti-inflamatoires to keep things settled down. Don’t worry. I am not running. I will not run today and I’ll see how I do over the holiday weekend. One thing I learned from my last 6 week pause from running because of my hip is… Doing too much too soon, is not a good idea. To be brutally honest, as I was in the middle of my 5K, I thought to myself… I am running this race to the best of my ability. I am not going to be stupid, but as long as my body cooperates, I will finish the race and run as hard as I can!!! Once I get back to normal, I will begin building a base for our half in February. It is cold in the South today (37 as a high) and very windy. Today might be a good day to take off and rest… I’m glad it isn’t 70 and sunny! The Magic City 5K will be memorable a memorable race for me! The temperature was 30 degrees at race time with 10 – 20 mile an hour winds. My app said the windchill was 17 degrees. We froze. 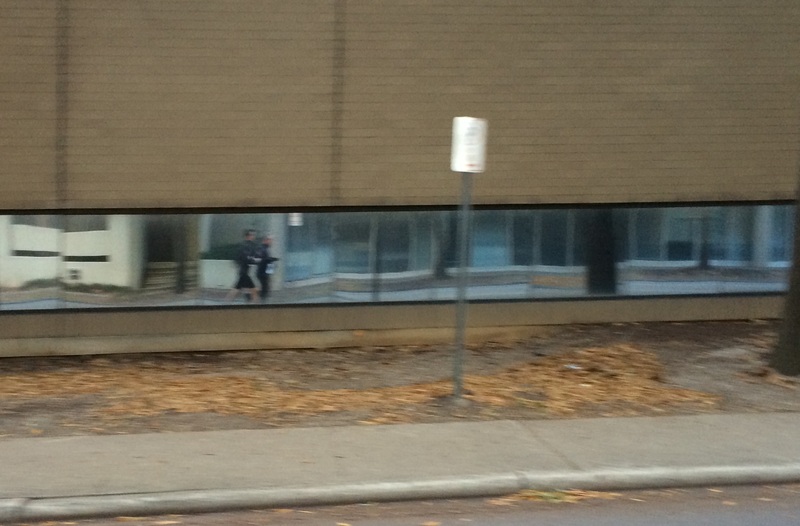 TJ and me running warmup laps – reflection of us in the window of a building. TJ and I ran some warmup laps and then waited at the starting line. The race started and he was gone. After the first turn I never saw him again until the end. For me, I enjoyed it a lot. The first mile went great. I managed a 7:05 pace which is good for me when I am training, let alone recovering from an injury. After that mile I slowed down a bit. My hip started hurting again right around the beginning of mile two (I know – I started to quickly). It never got bad enough to make me stop, but I was wondering at one point if I might have to get a ride back to the finish. Luckily that never happened. As I entered my final mile, I could see only two people in front of me. One was a 10 year old boy and one an older man. We stayed about 30 yards a part the whole mile. As we were on the last leg, the kid took off and passed the man. I just watched from a distance. I thought I might have a good chance of winning my age group since I didn’t see too many people in front of me and didn’t hear anyone behind me. As I came up to the finish, I misread the clock. My PR is 21:48 and the clock read 23:15. I got confused and thought my PR was 23:48, so I pushed really hard the last tenth of a mile (I paid for that decision). I finished at 23:53, which is a 7:41 pace. I was thrilled to learn I finished 11th out of 379 which, even if it isn’t a PR, I’ll take it! As I finished TJ met me with the news that he won the race!!! Wow, he has come in second in a couple of races, but never won. In fact he had to run behind the lead cop car for most of the race which meant he couldn’t run tangents. Still he came in 1st out of 379 people – very cool. We hung around for the awards ceremony which had already started. TJ went up to get his metal – I was so proud of him. When they got to the age group awards, I didn’t get one. I did notice that we must have missed the mens masters. Could I have placed in the masters? When the awards were all given out I went to the guy with the results. I asked about the masters and he look on his paper. There I was, 2nd in the masters category. Not bad for a gimpy old man. All in all it was an awesome day. We got to meet Ruben Studdard since this is a race he put on for his charity. We finally got to head home and enjoy our memories. Heading to the awards ceremony. Proud of my son!!! The coldest morning all year (35 degrees at race time) and my first 5K since August. We are about to head out. Should be cold fun!!! No, it isn’t what you think. I made the decision that I would run slow and easy since I ran hard on Wednesday. In the past I would run as hard as I could, even the day after a hard run. Well my recent 2 month off and on sabbatical from running because of my hip has made me a little wiser (I hope). So when I started my run I told myself that I wanted to run between a 10:00 – 11:00 pace. I decided that if I looked at my time and I was under a 10:00 pace then I would walk for a bit and then start my run again. That way I would keep pulling my nature to run hard in and hopefully keep from getting injured. I got a half mile into my run and had to walk. Actually I felt a twinge from my hip and looked and I was running near a 9:00 pace. So I walked for a few minutes and started running again. It wasn’t long before I was walking again. The most frustrating thing about starting and stopping my run was the fact I had to keep starting and stopping my iPhone. So one of the times that I was walking, I started pushing buttons on my Pebble and found that the middle outside button actually pauses and starts the app on my phone. So as I started my run I would press the button and my app would announce that it was started. When I walked, I pressed the button and my app would tell me it was paused. I no longer need to even interact with my phone. I don’t need to have auto pause on (which does not work well on the iSmoothRun app). In fact, I can put my phone in an arm band and never look at it again the whole run. Back to my run. I walked about a dozen times, but managed to get 3 miles in on the 4 mile route and my pace at the end was 10:39 – exactly where I wanted to be. This is the first time I was able to pull back and not run faster than I knew I should. Today is another run, hopefully between 8:30 – 9:00 pace and then tomorrow I’ll be walking my 4 miles. The race starts at 9:00 Sunday morning, but evidently there is a church meeting at the building where the race starts, so we will only have limited access to the building. It is going to be 35 degrees and we aren’t even allowed inside the lobby to keep warm before or after. Had I known that, I wouldn’t have chosen this race, but it is too late now. I do understand the church not wanting a lot of sweating runners hanging around with people coming in for services, but the planners of the Magic City Half Marathon and 5K should have made better plans, especially with the cold weather. Anyway, I’m looking forward to the 5K and it will be fun to run with TJ again. We haven’t run a race since the Lehigh Valley Marathon in September. RS has to work and so he can’t make it. Have an awesome Friday and rest of the weekend. I had the best run of my new running carrier yesterday. I consider myself as restarting my running as of this week. Of course that isn’t really the case. I have 2000 miles behind me over the past 20 months, but with taking so much time off recovering from my marathon and then multiple injuries, I feel like I am having a fresh start. It’s funny how the human body works. Some days are good and some not. Yesterday was good. In part of my run I actually reached BQ pace for the first time in months. Of course my shoe untied shortly after I got there. UGH. That was frustrating, but I just tied it and jumped right back into the run. At the three mile mark I stopped my app. I was at a 8:36 pace for the three miles. I then ran a slow final mile and even that came in at 9:08. So I am psyched for my 5K on Sunday. I really don’t think I have a chance at a PR, but I should be able to be a little competitive if my hip an heel stay well. It is going to be cold though… Probably in the 30’s by race time. That is much preferable to the heat and humidity of Summer, but still COLD for Birmingham. Enjoy your day and stay healthy! I had a good run yesterday. Unfortunately I had a little hip pain as I ran, but it was the first time I’ve run 2 days in a row in a long time. The pain was just sharp jabs – about 3 in a period of a couple of minutes. So I kept running. I feel fine today. In total, I ran 4 miles. To break it up a little, I run 3 miles, walked a bit and then the forth. Good times. I think TJ and I are going to run the Magic City 5K on Sunday. Assuming I can keep healthy, I would like to run a race. I haven’t run anything since my marathon in early September. I really enjoy running more after a race. I will not be looking to PR since nothing would be worse for my hip than to run as hard as I can for 3.1 miles, but I really want to go for the experience. The race is in downtown Birmingham. We last ran downtown was during the Mercedes half marathon last February. So with this race I will feel like my running is beginning to get back on track. With the Mercedes Half Marathon next February, I’ll have to begin training soon. I haven’t run more than 5 miles at one time in months. Last year I ran the half in 1:44 and I’d really like to beat that this year if possible.